A brief overview of my experience biking across Laos and a link to the photos. After Cambodia (read my blog report about it here), we rode from south to north across Laos. The highlight was a week of fantastic climbing at a small climber’s paradise of bungalows nestled at the foot of some karst peaks near Thakhek. 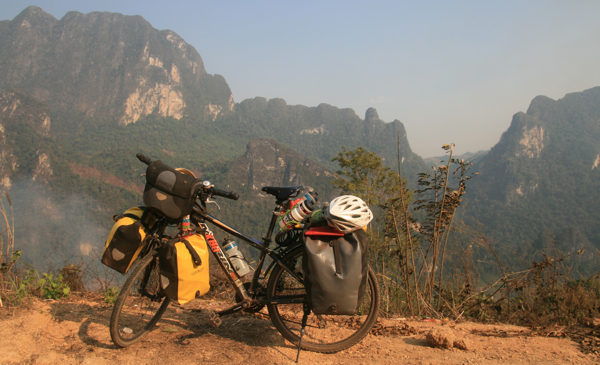 And finally, after months of almost entirely flat biking we reached mountains in northern Laos. One night as we stumbled into a guesthouse on wobbly legs after a particularly long climb (about 26km of steep uphill) we noticed two other touring bikes and an older American couple popped around the corner. In chipper voices they explained that if you just go into the kitchen you can scoop out half a bucket of boiling water from the giant cauldron which you can mix with the cold water from the tap down the hall and have a really fantastic warm bucket shower! After following their advice we sat down for a drink with them and learned that they had also done the same climb as us – but they had done it the week before, reached the lovely town of Luang Prabang, had a rest, and decided to turn back and do it all again! We straightened up in our chairs and pretended not to be so tired as we heard all about their adventures bike touring for three months every year for the last 35 years! Sally and Peter were just the kind of energizing inspiration we needed to make the hills for the next few days not seem quite so steep. They have a great website called Ride the Road. Aside from these inspiring encounters, our experience of Laos seemed very different to what our friends and guide books described just a few years ago. I had imagined pedalling along forested roads with almost no traffic. What I saw instead was cleared land, extensive burning and many trucks and (expensive) cars. To be fair, we also passed many signs for protected areas down side roads away from the main road we were traveling, but overall this was not the still-pristine tropical cyclist’s paradise others before us had described. After a few days of this I decided to reread the guidebook a little closer and noticed that Laos’ GDP is growing at a rate of almost 8% per year. A similar thing had happened to me on a different trip to Malaysia when I visited some small islands that online articles written just three years earlier had described as idyllic willdlife spots, dotted with a few simple bungalows and free of ATMs, internet and too much tourist development. When I arrived there was trash and huge ugly concrete piers on every beach. All of this has made me think about how rapid growth affects a country and what scary truths hide behind the polished face of tourism. Tourism is supposedly the largest sector of the world economy. And where tourists go, the industry has a significant impact on the environment and social conditions of an area. I’ve considered working in ecotourism because I like bringing people in contact with nature in ways that gives them an inspiring experience that might lead them to care that much more about our natural environment. But trying to create a special experience for tourists is one of the greatest risks of the business if it leads to ancient communities being relocated from natural areas to make them seem more pristine or other such absurd but unmentioned rearrangements of landscapes to match tourist expectations. The truth is that not all of our experiences in nature will be beautiful and inspiring. The question is how do we give people a realistic experience of the natural world (and the social conditions that shape it) that motivates them to be more environmentally conscious in their daily lives? To see what I saw in Laos take a look at my photos from 1,700km and six weeks of biking across the country.